Perfect cereal bowl and can be used for salsa and other dips. There is nothing better than starting your day by having a whole-grain breakfast with cereals filled in this Handcrafted Boleslawiec Pottery 5.5" Cereal Bowl from Pottery Avenue. Featuring a curved profile and a medium size, this Polish Stoneware exhibits a durable design that makes it tough enough to withstand varied temperatures so that it can be used for baking and refrigerating. The non-toxic paints make it food-safe, while the stylized botanical pattern grants it an heirloom value. 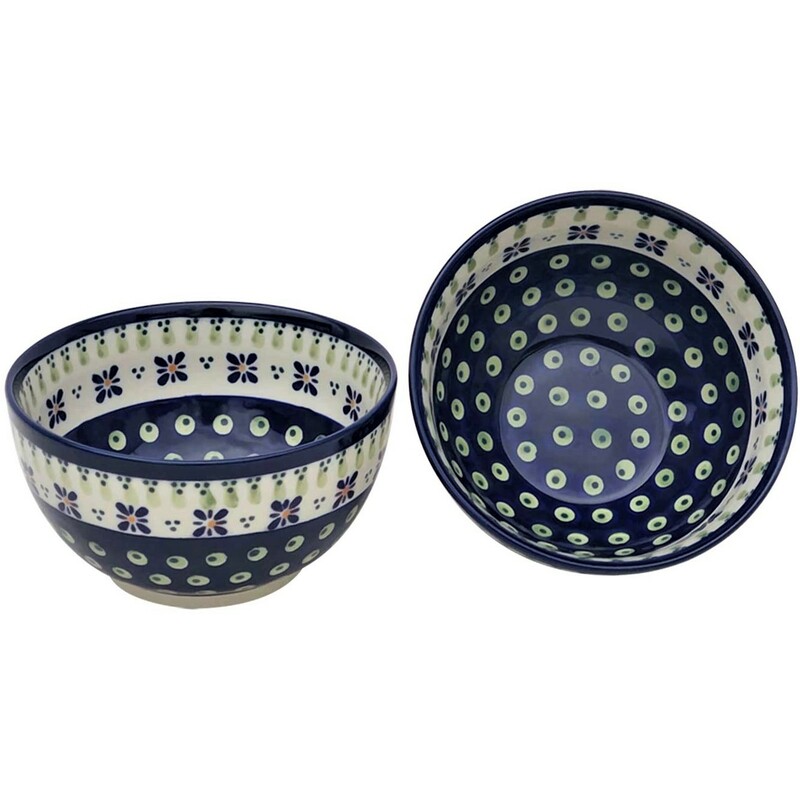 This Polish Pottery can be used to serve dips and snacks too as it accentuates your home with the eye-catching, hand-stamped, DROPS OF JOY design. Authored by Danuta Amborska. who began her career in 1977 and is now a senior designer and manager of Zaklady’s design team. DROPS OF JOY is a classic pattern that is individually handmade with stamps made by cutting the design into a sponge with small scissors. Then the design is applied using cobalt blue, celadon green and a kiss of tangerine orange. Hand-painted with centuries old technique and the famous white firing clay of Boleslawiec, makes the best choice for table top glamour, function and durability. Hand-Painted Polish Stoneware Folk Art - A Century-Old Tradition. In the small village of Boleslawiec, Poland, hundreds of skilled artisans have migrated to this region to produce wonderful works of art for our daily use in the kitchen and home. They continue the Polish folk art tradition of painting on vessels using the hand stamp technique. These pieces go way beyond just good looks. The unique glaze, clay and high firing temperatures result in cooking vessels of enormous durability. In fact, you can cut right on these pieces without marring the surface. The glaze allows food to release with little or no oil. The pottery retains both heat and cold for long periods of time, making them wonderful pieces for cooking and serving. Dishwasher, oven and microwave safe. This 5 cup casserole with lid will inspire many beautifully prepared recipes while adorning your table with wild flowers and leaves depicting a European landscape. "971/296A DROPS OF JOY".